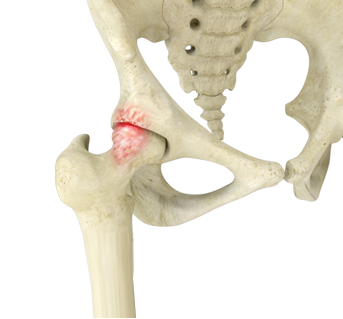 The hip joint is made up of the femur and pelvic bone. The rounded head of the femur articulates with the cup-shaped socket of the acetabulum (a part of the pelvic bone) to form the ball and socket joint of the hip. Smooth, friction-free movement of the hip bones is facilitated by cartilage tissue that lines the articular surfaces of the femur and acetabulum. The joint is further stabilized by the labrum, a ring of tissue that lines the acetabulum. Cam Impingement: An out of round or abnormal bump on the femoral head or neck. When the hip is bent, the misshapen ball can rub against the acetabulum (socket) causing impingement. Pincer Impingement: Extra bone growth on the rim of the acetabulum (socket). During activities, the extra bone of the acetabulum can rub against the femur causing impingement. Combined Cam and Pincer Impingement: Bone outgrowth on both the femur and acetabulum causes excessive rubbing. Over time, FAI can damage the labrum and cartilage, leading to osteoarthritis of the hip joint.